An easy target, I know, but I was voting today and I can't believe this guy is still on the ballot. And every time, he knows he's not even going to come close to winning. That takes guts. The guts of a guy who's completely crazy. Lame List - When you're tired of reading our gome of the week column, shoot over here to see what's weak this week. One love and RIP to the Jam Master. And sure, you've seen Krush-Groove, but have you seen this bad boy? That's right, it's Tougher Than Leather, and that's Rev. Run holding a shotgun on the cover there. 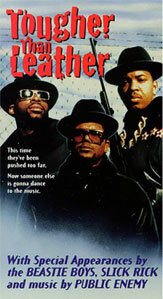 And it's a Run-DMC movie that's rated R.
So, needless to say, it's great. The Beastie Boys make a fairly awkward appearance while they're in their pre Paul's Boutique stage and so does Rick Rubin, who I think directed this bad boy. They can't really act, but what the hell. Old school at it's best. The original and still the best. 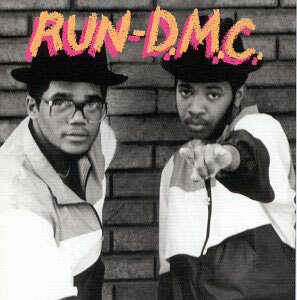 Nothing but a drum machine and some 18 year old kids with hats and sideburns and no idea that they were going to change music forever. I still listen to "Sucker M.C. 's" and "Hollis Crew" and will probably never get sick of them. "I don't drink vodka/ keep a microphone inside my locker"
thin mizzy - The state of a person after they get dumped. Thin and miserable. Usage - "Dude, have you seen Todd since he got dumped by that skank?" "Dude, he was fat and happy when they were dating. Now he's all depressed and losing weight, thin mizzy style." 10. "Kevin Mannix? More like Kevin Manwich." 09. "Dude, that joke sucked on so many different levels." 08. "Beer goes good with voting." 07. "Does anyone here have dentures? No? Than I'm not voting for this denture one." 06. "Gordon Smith? More like Bored and Stiff." 05. "That made a little more sense, but still sucked." 04. "I hope this doesn't take too long, I've really got to take a dump." 03. "I'm writing in Steve Balboni for district 4 rep."
02. "Isn't there anything on here about lowering the price of whiskey?" 01. "It feels good to make a difference. Now nobody go in the bathroom for about an hour."